I was looking at my Instagram account this morning. Flicking through picture after picture and quickly, I got to “BC” pics, or “Before Cancer.” I’ve looked at old pictures a lot in the past three months, there’s a sense of such warmth and goodness to looking at smiles on my friends and family faces. And smiles on myself, reminding me of a life that I was living and loved so much. However, today when I was looking at these pictures, it felt like a previous time. Like a past life. A time that I’ll never get back. Because the truth is, I really will never get it back. I’ll never be the same girl I was when I rang in 2014. But in all honesty, how could I ever think I would be the same person? It wouldn’t make any sense. As with anything difficult in life, you can’t go through it and stay the same person. Isn’t that the whole point of the journey? I remember ringing in the New Year and thinking about just how amazing 2014 was going to be. I had just moved in with Mike a few months before and things were going swimmingly. I had just gotten my first promotion and would be beginning to work on a new brand, doing new and exciting things. I had an adorable 4 month old niece who I loved more than I knew was possible. I had amazing friends and an amazing family. I was feeling truly at the right place at the right time. I was feeling like this was my time. Things were falling into place and years of hard work were starting to come together. I could see clearly of where I was headed, what I wanted to do. And then January 14th I woke up in the middle of the night with the feeling like a tractor trailer was crushing my tailbone. It would take over a month to figure out what that crushing feeling was exactly but I think of that moment now as so symbolic. Symbolic of how quickly life can change. How quickly things can completely take a different turn. Logically, I know that that wasn’t the exact moment that the leukemia hit my blood stream but in my mind, I think of it like that. I think of it like I went to bed on January 13th a normal, healthy 24 year old and I woke up, on January 14th with my life being crushed and ran over by the leukemia tractor trailer. What’s even more symbolic is the fact that I would be struck by this disease, by this horrible, horrible disease on the very day that person who has saved me through all of this was born. January 14th is Mike’s birthday. Mike has made me laugh when nobody else can. He’s made me smile when I’m grumpy. He’s given me hugs when I don’t want to be touched. He’s kissed my forehead when tears are running down my face. He’s made me genuinely happy…happy in a time when I could never have imagined being happy. He truly is my angel. And so it feels fitting that my modern-day angel would be born on the day that I began to truly need him, to depend on him in all the ways a person can really depend on someone other than their self. As I’m sitting here at my kitchen table writing this post, I’ve lost all sense of my emotions. (it’s probably not helping that Florence & the Machines are on in the background and it’s raining heavily outside). But I can’t stop crying and I don’t really know why. I’m having such mixed emotions. I feel so physically and mentally exhausted today. But at the same time, I feel sharp. Recounting in my head all that I’ve been through and thinking about all I will continue to go through has brought me to a sense of clarity. Maybe it is still my time after all. The question “Why me?” has gone through my head a thousand times. I’ve probably thought it 10 times just sitting here writing this post. But it suddenly dawned on me that I should stop questioning “why me” and try to feel grateful for being “chosen” to go through this journey. If I view it as something I was chosen for rather than something that just unfortunately “happened” to me, it gives this whole experience a bigger purpose. So why was I chosen? Why me? Because I can deal with it. 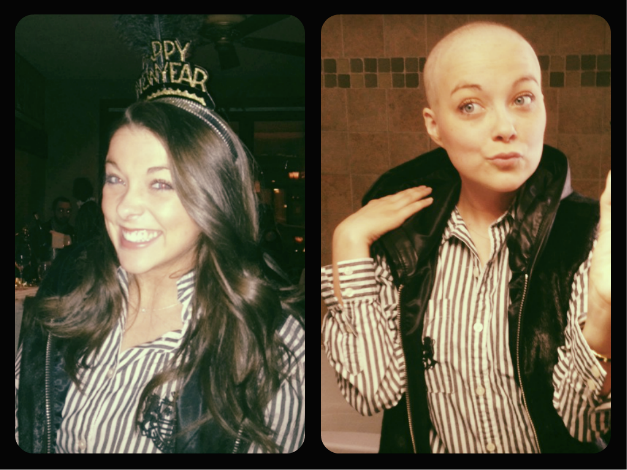 Because I am so much stronger and better than this disease. Because I am blessed with family and friends that are so much better and bigger than this disease. Because I will walk away from this disease and be a better person. A stronger person. A more caring person. A more giving person. A person that helps others and makes a difference in the world. “AC” Jessy will be so much better than “BC” Jessy.